Pulp mill effluents (liquid wastes) are also a source of endocrine-disrupting chemicals, neurotoxins and other dangerous contaminants. 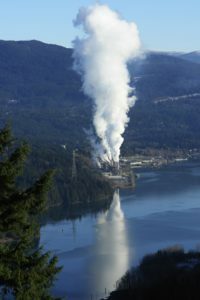 In 1992 the BC government adopted a regulation requiring pulp mills to reduce their discharges of organochlorines (AOX) in two stages, reaching zero discharge by the end of 2002. If the regulation had been fully implemented, BC would have had the highest standard in the world for organochlorines in pulp mill effluent. BC’s pulp mills successfully reached the first phase target, thereby reducing their organochlorine discharges considerably. However, in 2002, with the deadline approaching, the government repealed the “zero discharge” requirement and replaced it with a far weaker standard. As a result, BC’s AOX standard is now lower than that in much of Europe. Organochlorines are still being discharged into our marine waters. In addition, BC’s regulations regarding discharges of other toxic substances from pulp mills, such as black liquor, are less stringent than those in the US. Despite these low standards, pulp mills in BC routinely exceed their Ministry of Environment pollution permits – with little or no consequence. Air pollution from pulp mills can cause a wide range of health problems as well as environmental impacts. Pulp mills are BC’s largest single source of airborne dioxins, which are known carcinogenic substances that persist in the environment and in the bodies of animals (including humans). Particulate matter from pulp mills are also toxic, and mills create pollution that leads to smog and global warming. These are only a few of the known impacts. Sludge is the solid waste left over from wastewater treatment plants. It is a complex and changeable mixture of dozens or even hundreds of compounds, just like mill wastewater. Some are well known, like heavy metals, dioxin and other organochlorines. Some, created by the bacteria in the treatment ponds, are probably unknown to science. Pulp mills are running out of landfill space and want to spread sludge on our forests, parks and farms. While it might seem sensible to “re-use” the nutrients in this waste product, sludge still contains many toxic chemicals whose impacts on the environment and our health are not fully known. The key concern about spreading sludge on land is that we simply don’t know what is in the sludge, how those chemicals will interact and what impact they could have on the environment. That concern was not helped when in 2005, the province reduced the number of compounds required for testing from 50 to 11, reducing our understanding even more. Until we have more comprehensive testing of what’s in the sludge, no spreading of it can be considered safe. Pulp and paper production doesn’t have to degrade the environment, air quality or human and wildlife health. New technologies exist for achieving these goals. However, not enough mills in North America do not use these clean technologies. A loud consumer demand for products created without using chlorine compounds has started but it needs to continue. The production of pulp and paper does not have to mean inevitable damage to the environment. When buying paper products, choose those that are either unbleached, or bleached without chlorine compounds. Watch out for “elemental chlorine free”: this is NOT made without chlorine compounds – it’s simply bleached with chlorine dioxide instead of chlorine gas. It’s still harmful to the environment and our health.